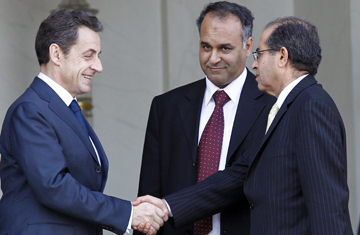 French President Nicolas Sarkozy, left, shakes hands with Mahmoud Jibril, right, and Ali Al-Esawi, representatives of the newly formed council based in the eastern Libyan city of Benghazi, after a meeting at the Elysee Palace, in Paris, Thursday, March 10, 2011. The last time a Libyan leader traveled to the U.S. and Europe to talk to his international counterparts, he wore desert robes, slept in a Bedouin tent, and vilified the West in incomprehensible diatribes. Now, the Libyan leader holed up in meetings with top diplomats in foreign capitals wears a suit and tie, speaks flawless English, and flaunts a Ph.D. from the University of Pittsburgh. In brief: Mahmoud Gebril is about as jolting a contrast from Muammar Gaddafi as one can imagine. Gebril, 58, was picked by the rebel leaders in Benghazi last month as the interim of their National Council  an attempt at cobbling together a shadow government, ready to run Libya the moment Gaddafi leaves. Though that victory is hardly assured  a military stalemate or defeat looks equally likely  for Gebril, the moment to start behaving like a head of state has already arrived. And in Benghazi on Friday, Gebril's colleague, Libya's defected justice minister Mustafa Abdul-Jalil told reporters that a ceasefire in the war could require "Gaddafi brigades and forces [to] withdraw from inside and outside Libyan cities to give freedom to the Libyan people to choose and the world will see that they will choose freedom." In recent days, Gaddafi's hugely powerful son, Saif al-Islam's top aide, Mohamed Ismail, has reportedly been talking to British officials, perhaps about a deal to end the war against Gaddafi. As for Gebril, his grand international debut came on Tuesday, when foreign ministers from more than 36 countries, as well as U.N. Secretary General Ban Ki-moon, converged in London to thrash out a plan on how to oust Gaddafi and save the rebels. Hosted by British Prime Minister David Cameron, it was the first gathering of the sprawling coalition since the West began bombing Libya on March 19. Yet despite the high-profile guest list, the man most in demand was a slightly tubby, slightly balding policy wonk whom most of the diplomats had only become aware of a few weeks earlier, when Gebril was filmed shaking hands with French President Nicolas Sarkozy at the Elyseé Palace, moments before Sarkozy announced that he was recognizing Libya's rebels as the country's true government. On Tuesday, U.S. Secretary of State Hillary Clinton began the day's frenzied diplomacy with a closed-door meeting with Gebril, who also had discussions with Cameron, British Foreign Secretary William Hague, and French Foreign Minister Alain Juppé, before jetting off to Qatar that evening for further talks there. Racing between appointments, Gebril canceled his appearance at a press conference in London, sending a spokesman instead, and aides apologized to TIME that he was far too busy to be interviewed. That has not always been the case. In February 2010 Gebril, then head of the National Economic Development Council, invited me into his large office in the Libyan capital Tripoli for a leisurely talk about the country's future. The semi-governmental think tank had been created by Saif al-Islam to design Libya's transformation from an arcane autocracy into a modern democratic state. For the rare visiting journalist, the organization was touted as proof that Gaddafi was serious about overhauling Libya; its strategic partner was Monitor, the Boston consultancy group, which has been heavily criticized in recent weeks for its ties to the Gaddafi regime. Gebril's motivations seemed heart-felt, however: He had been lured into the job by Saif  after years of teaching strategic planning at the University of Pittsburgh and then running a regional, Libya-based business consultancy  on the promise that the hard-line revolutionaries with whom Gaddafi had surrounded himself for years would agree to far-reaching political change. To those eager to see reform, Gebril seemed the brightest hope in years. "He's a real talent," says a former Western ambassador to Libya, who did not want to be named. "He's a good administrator, and nobody knows more than he does about the issues in Libya, economic and development, both macro and micro." The vision for Libya which Gebril outlined to me last year was as revolutionary as Gaddafi's bloodless coup in 1969. His aim, he said, was for full, Western-style civil rights, of the kind never before known in Libya, let alone in most of the Arab world and Africa. "My model is South Africa," Gebril said, referring to that country's constitution which was adopted in the 1990s after decades of apartheid rule, and whose extensive bill of rights includes freedom of speech, the right to privacy, and gender equality. "There must be a legal framework with division of powers, the right of free expression," Gebril said. Since Libya's huge oil wealth had given the country relative prosperity, with the highest per-capita income in North Africa, Gebril felt it was necessary to harness the talents of Libya's seven million decently educated citizens by investing billions into job and skill creation. "Ultimately we have to break the dependency on oil," Gebril said  more than 90% of Libya's revenues comes from oil and gas sales. "Libyans feel they have a lot of catching up to do." Despite his years studying and teaching in the U.S., Jibril was deeply critical of U.S. policies towards Libya, which he said had not brought U.S. investment in the country after U.S. sanctions were lifted in the mid-2000s  and hence, in his view, had missed the chance to transform Libya's politics. At the time I met Gebril, Libyans were outraged that their country was included on the U.S. Transportation Security Administration "watch list," despite having abandoned its weapons of mass destruction program in 2003 and begun cooperating on intelligence. "There is bitterness that we extended a friendly hand and instead of meeting us halfway, we get slapped in the face," he told me. Gebril finally came to believe that his reform vision could never happen under Gaddafi. His grand plan  and arguably that of Saif al-Islam's  collided with the hard-liners, who stood to lose their lavish patronage if Gaddafi's Green Revolution collapsed. "His time there ended in disillusion," says the former Western ambassador. Not only did he resign shortly after my visit with him, but last month he joined the rebel battle to crush Gaddafi. In Tripoli last month, Saif al-Islam told me that he had been betrayed "big time" by his closest allies  chief among them, perhaps, Gebril. It remains to be seen whether Gebril's Western ways can succeed in a deeply tribal country, whose historic ethnic divisions could run counter to a liberal democracy. Still, his ideas now have a far more powerful audience: The world's leaders. Gebril arrived in London on Tuesday carrying a two-page document entitled "A Vision of a Democratic Libya." To those with prior knowledge of him, it sounded very familiar. The manifesto began with the aim to "draft a national constitution ... separating and balancing the three branches of legislative, executive and judicial powers," and then listed numerous civil rights for Libyans, including freedom of expression, free elections, free private enterprise, a peaceful transfer of power from Gaddafi, the empowerment of women, and a denunciation of violence, terrorism and intolerance. And this time around, the coalition is banking on Gebril to see his plan through to completion. See the coalition troops' battle in Libya. See a TIME photographer's dispatches from Libya.